We Are Scientists are back! In the run-up to the release of their fourth album Barbara, bassist Chris Cain chatted to Robert Dalling about the new release, their future, and his own university experience. Barbara's lead single 'Rules Dont Stop' harks back to the sound of popular second album With Love and Squalor after a change in sound on last release Brain Thrust Mastery. "I think it was something we set out to do before we even began to write." Chris Cain conceded. "We felt after Brain Thrust Mastery we needed to get back to the stripped down sound of With Love and Squalor perform once again as a three piece." The sound isn't the only alteration that the band has made since Brain Thrust Mastery. Changes have also been made in personnel. The impressive acquision of former Razorlight drummer Andy Burrows arguably strengthens the band's line up. "Andy has been a friend of the band for about a year. We first met him generally as you meet other people in your trade. He is a super friendly, affable dude that one quickly becomes friends with. We had talked to him before he left Razorlight about the possibility of drumming on a couple of tracks and at the time we had a number of different drummers to do one or two tracks for Barbara. But Andy left Razorlight and when we became aware of his availability to potentially do more we talked to him about it." "We were very excited to do a record together. He moved out to New York in the summer and it was great. It's working out very well. He's definitely the best drummer we have ever worked with in terms of his musicianship. The only downside is that he has a solo record coming out this summer as well which he is in the process of finishing up, and his availability for touring is going to vary a little bit. Unfortunately Andy will not be a traditional full member of the band for the time being. He will often be invisible, but we are going to include him as much as possible and were going to do the next record together as well." The band recently played their return gig in the UK, at London's Hoxton Bar and Grill a gig which sold out in the record time of three minutes and 25 seconds. Here, they got the opportunity to sample a live reaction to the new material. "We played six or seven new ones. New songs are always a bit harder to sing along to because you've never heard them before, but people seemed pretty happy with it," Cain told us, enthusiastically. "We talked to everyone for one or two hours afterwards and there were one or two songs which they picked out, were very excited about and latched on to, which is very encouraging. I would say overall that it has come across live even better than our previous albums." The same weekend they were also in attendance at this year's NME awards in London, where Cain told of his personal disappointment of how the night turned out. "We were meant to be sitting next to Dwayne "The Rock" Johnson but he didn't show up. We were very excited at the possibility to meet The Rock. I'd say he owes me and Keith (Murray- lead singer) a rain check." W.A.S have announced a number of festival appearances over the course of the year, including Camden Crawl in London on Sunday May 2 and Reading and Leeds over the August Bank Holiday weekend. "Our agent came to us with the offer to do one of the Camden Crawl shows. We are excited at the prospect to play in such a historic venue like London's Roundhouse. There's going to be some MTV involvement where it will be on TV so we are looking forward to have the opportunity to get the new songs out to some new people on a mainstream basis.". "We are going to be in the UK on and off throughout the next year. At this point there are no plans for a lengthy 25 date tour booked and we will probably not get to do anything like that until the fall, as we have many festivals lined up, but we will be coming in and out at different points with single releases and occasional shows." The band have received a lot of success on UK soil, arguably more than they have in the US. Cain discussed his thoughts on why, as a New York based band this was. "I think it's less to do with the sound and more to do with the way things worked out. When I say that, I mean that we had more radio plays earlier in the UK - dating back to 2005. We got off the ground running, and in turn our touring was rewarded by more press on the radio, newspapers etc. The UK has always been our priority, and because of that we have never really had time to focus on the US, and at this point it's never going to be our priority." 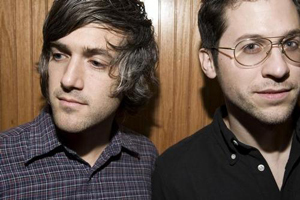 Despite releasing some great material throughout the first three albums, We Are Scientists are yet to obtain that commercially successful song to grasp a wider mainstream audience, with their highest chart position obtained being at eleventh with song 'After Hours'. Cain spoke of his hopes for a change of fortune with the new album. "I think anybody who is out there in a pop band is interested to a degree about getting as much exposure as possible. We certainly would be happy to increase our listenership. The second single that is going to be coming out called 'Jack and Ginger' is probably going to be our bid at that exposure. I think it stands a pretty good chance. Maybe 'Rules Dont Stop' may do it, but i think that is calculated to be more of an intro single for Barbara and then 'Jack and Ginger'will be one that will appeal to a broader audience." Cain continued his premonitions, explaining his hopes for the future. "I'd say that this record will do a little better than the first two have. I like to imagine in terms of our presence as a band that we will be one day headlining festivals. Most importantly I'd see us making a few more records, continuing to make great music. Would we like to get to a position where we could call all the shots backstage front of the stage and everything? Yes we would. But I think we'll stick to what we're doing and hope to progress from here." As a band that met and formed whilst studying at Southern California University, I asked Cain upon closing to reflect on his own university experience, and pass on any advice to current students. "I graduated in International Relations but I majored in babes. I'd advise students, however boring this may sound is to just enjoy the material, try not to focus on what is good for you but do something instead that will give you a buzz. In my experiences, even before the band took off I have never done anything specific as a result of my degree in college. I've always felt that the more important thing was that the experience really develops your mind. I'd say focus less on what you are majoring in and realise the fact that you have access to lecturers who know a lot, because once you leave it is much harder to gain insight into that kind of experience."